Unfortunately the beginners didn't get much climbing done this weekend. 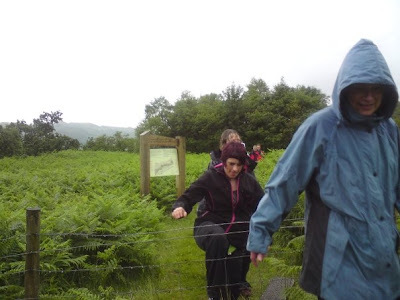 Although regular visitors to the principality will not be surprised by the conditions, it turned out that this was not the usual Welsh wet weather and that it was just as bad, if not worse, in the Lakes. Anyway, here are a few of Fiona's photographs from the weekend. 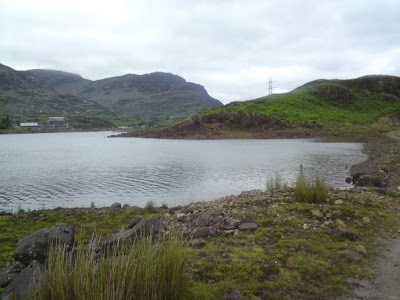 These two photos, one above and one below, are taken looking across the Tanygrisiau Reservoir in the direction of Craig y Clipiau, one of Y Moelwynion. The buildings on the left of the picture above, are part of the hydroelectric power station which uses the Tanygrisiau Reservoir. On the hillside above the power station are some of the other Moelwynion crags including Clogwen yr Oen which is home to Kirkus's Climb Direct 64m Severe 2*. This is a remarkably steep and exposed route for the grade and is well worth a return visit. 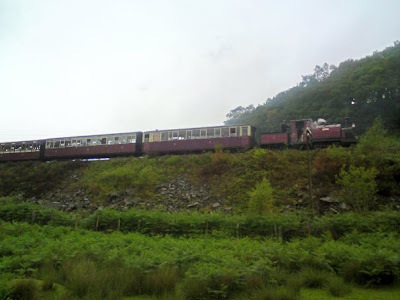 This is the oil fired steam locomotive Prince on the restored Ffestiniog Railway which runs from the slate mines of Blaenau Ffestiniog down to Porthadog on the coast, from where the slate was once transported by ship. It's the Summer Solstice. The start of summer. And the longest day of the year. 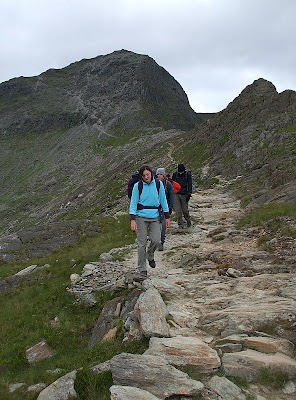 And after a night in the David Imrie Hut and breakfast at Booths, Andy C, Graham, Jonah and Ste load their heavy packs onto their backs and set out from Seathwaite. Andy G and Jeff plan to join them during the afternoon, while Mark, Dan and Richard, and also Jess and Jason, will travel up later that night. 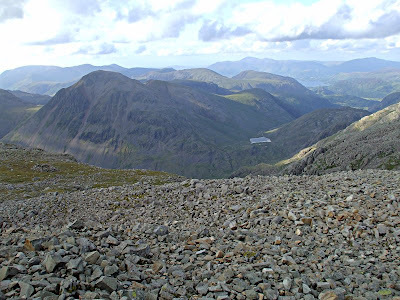 Several sweaty hours later, after a brief rain-shower and an encounter with a pessimistic southerner who was swiftly ignored when he claimed it would rain all weekend, and with tired legs and sore shoulders, the tents were pitched just west of Lingmell. Minds and muscles were nourished and rehydrated, and enthusiasm stoked. And while the buttresses of Scafell looked damp, Pikes Crag was dry, so Grooved Arête (VD, 2*) became the afternoon's entertainment. Andy C and Jonah quickly despatched this, and wandered off to examine the more exciting, and by now dryer buttresses on the other side of Mickledore. 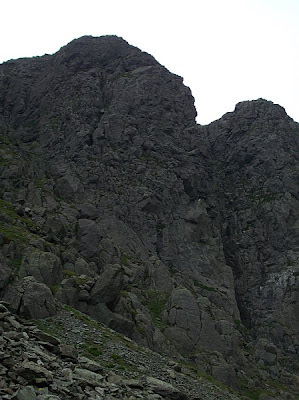 Graham and Ste were still enjoying the upper pitches of the route - and by now could see Andy G and Jeff pitching their tent after their excursion to the summit of Scafell Pike. 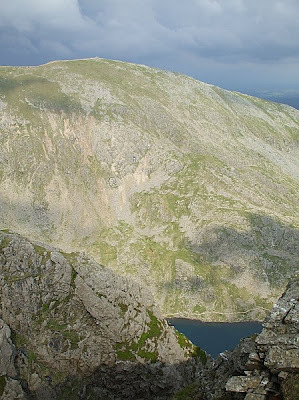 By the time they were back at the base of the crag, time had moved on sufficiently for Graham and Ste to want some tea more than another route, so they promptly returned to base-camp. While Ste passed round his latest elixir, the medicine-like cherry-menthol tune flavoured gin(a home-made concoction containing no less than 5 packets of tunes), Andy C and Jonah had been unable to resist the temptation of another route, and were now having a great deal of fun on Moss Ledge Direct & Jones' Arête (VS 4c, 3*). 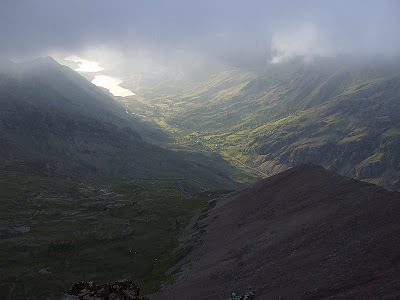 Darkness fell as they were completing the route, but a torch-lit 'a cheval' traverse over the knife edge ridge at the top of Scafell Pinnacle and a misty descent from the summit plateau and down the Foxes Tarn gully still remained before they could drop their guard (Wasdale MRT advise that the Foxes Tarn gully is currently less safe than Lord's Rake). After being delayed by traffic on the way up, Mark, Dan and Richard eventually leave the cars behind and set out on foot to find our camp at Lingmell Coll. Andy C and Jonah finally return to their tents and reward themselves with a gin & tonic or two. Unknown to the rest of us, Mark, Dan and Richard are reaching the col under Lingmell after a late start. Unable to locate any tents in the darkness, they decide to pitch theirs' on the opposite side of the col. By this time Jess and Jason had already given up and resorted to a B&B. The late arrivals are keen, get up early and see the other tents about 500m away. However, they also catch sight of figures approaching the crag and assume that they are already late. Mark, Dan and Richard arrive at Central Buttress and make a start up Botterill's Slab (VS 4c, 3*). Nearly two hours later Jeff and Andy G arrive under the same route, while Ste and Graham find the base of Moss Ghyll Grooves (MVS, 4c, 3*)... But before any gear is even removed from the bags the rain begins. 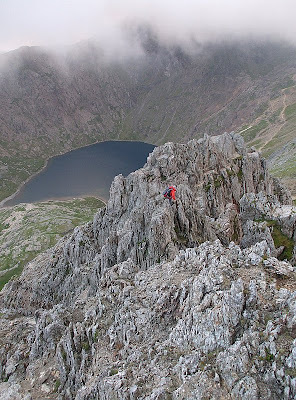 Whilst waiting for it to pass, Jonah and Andy C arrive, and they all point and laugh at the hapless party on the now very damp Botterill's Slab, where the second is off route on pitch two as he tries join the others on the stance. It doesn't look like the rain will pass any time soon. 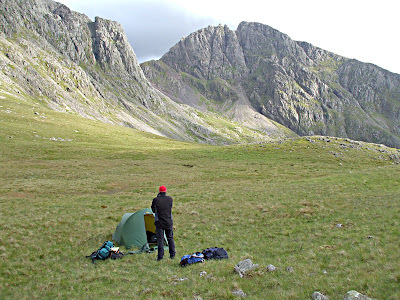 Hoping the weather will be much improved on Sunday, Jonah and Andy G suggest leaving the tents and gear, and spending the day eating heartily, and drinking heavily in the Wasdale Head Inn. No one objects. High on the crag, now Richard has arrived at the stance after going off route towards the top of the second pitch, Mark suggests that an abseil retreat is the best option for self preservation. Again no one objects. Once back on terra-firma, a no nonsense policy is followed, tents are promptly packed away and they're soon heading back towards Seathwaite. All day the rain fell steadily harder, and the wind blew progressively stronger. 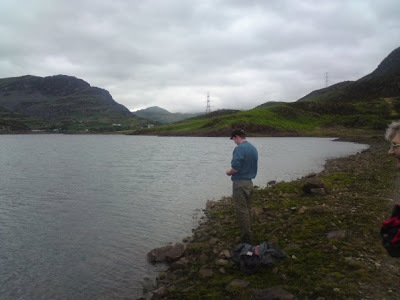 And while Mark, Dan and Richard had dried themselves off, checked into a hostel in Keswick, and made a start on the beer, there were six men in Wasdale reluctantly preparing to battle their way back up to their tents. 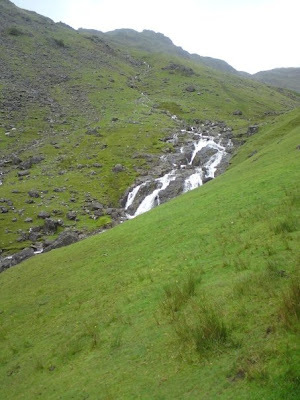 As they branched off left up the spur leading directly up towards Lingmell, they could see hoards of Three Peak Challengers queuing up at the crossing of Lingmell Gill which was now in spate... and then some. 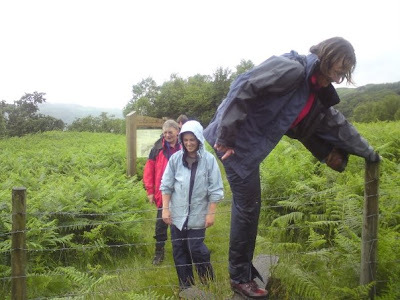 Although they didn't have a hazardous river to cross, as they got higher, Andy C, Andy G, Graham, Jeff, Jonah and Ste found it more and more difficult to walk into the ever strengthening wind and rain. It was with some relief when they finally reached the tents and saw they were all intact, and although Graham and Ste found that the dry ground they had pitched their tent on had become a marsh and the floor of the tent was a little damp, it mattered little anyway because sleep was constantly being interrupted by the howling of the wind and the sound of buckets of water being thrown at the tent and the occasional faint whistle of a distress signal from somewhere on Scafell Pike. After spending all day feasting, drinking and even patronising a night club, Mark, Dan and Richard finally return to the hostel much to the annoyance of their dormitory mates. The weather hadn't improved. Not even slightly. 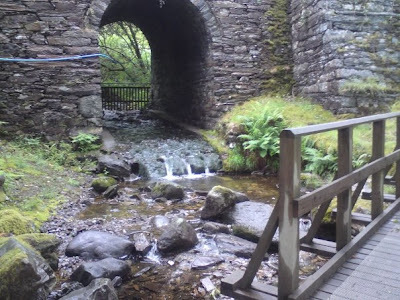 So tents were bundled into their packs, and with everything now sodden and even heavier than it was when they hauled it up there, the six remaining campers started back down the mountain to Seathwaite. But it wasn't as easy as that. Every river crossing - normally just a hop, skip or jump, was now treacherous because they had swollen so far beyond their limits. Jonah's walking poles were passed back along the line to aid the crossings and to help prevent anyone being swept off their feet and down the ghylls. And there was the wind. Every one of the party was at some point blown off their feet. Most of them more than once. In fact while approaching Styhead Tarn a pair of fell-runners floated gracefully past on the 'breeze', before the back-packers were all caught out by the gale-force gust that came in their wake. 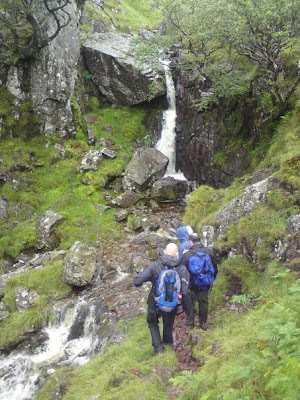 After crossing the last, but without doubt the most forcefully raging torrent just above Grains Ghyll, Seathwaite was reached and there was no hesitation in diving into the cafe for tea and cake. More tea and cake followed in Keswick. And then home, all still unaware that Mark and Dan and Richard had been on Scafell a little over 24hrs ago - it wasn't until e-mail was exchanged on Monday that everyone first heard they had been up there. 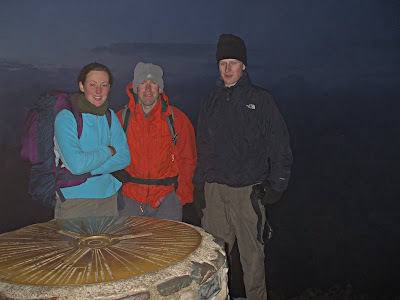 Photos from last weekend of an over-night traversal of the Snowdon Horseshoe with a bivvy on Snowdon summit. 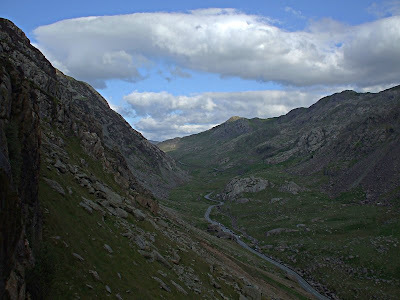 A couple of photos from a recent trip to North Wales showing the Llanberis Pass and Crackstone Rib on Carreg Wastad. 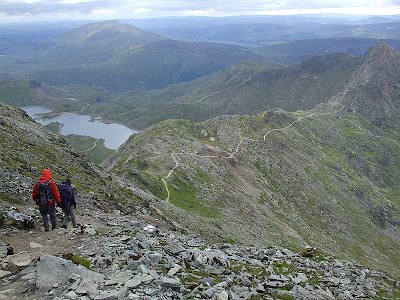 On Saturday 7th, the Andys C and G, together with Graham, Richard and the prolific JeffB made their way to Coniston for an ascent of Dow Crag. Despite the good weather, it was cool in the shade and we were glad to get going once Graham had resolved a few route finding difficulties on pitch two. Things went smoothly after that and we managed to find the correct traverse line across the very exposed slab on pitch five which had caused Pope Paul such consternation on a previous visit with MarkD. We topped out in the glorious sunshine of a perfect Lakes summer afternoon and still had time to visit a hostelry in Coniston for refreshment before starting the drive home. A most excellent route at the grade, continuously exposed with sustained technical interest and taking an ingenious line through some very imposing scenery. Highly recommended to competent parties. 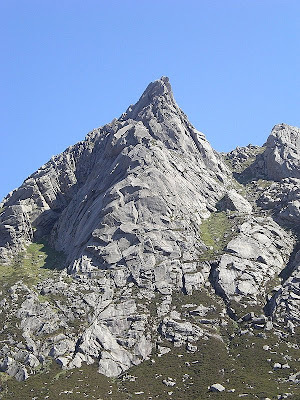 South Ridge Direct, Cir Mhor, Arran. Now, Graham being Graham, had some idea of what this climb was all about. Long had been the hours spent pouring over the guide books and descriptions of this route, and long had been the time that it had been on his wish-list. Jeff being Jeff though, had never heard of it. Short had been the minutes looking on-line at Google's findings, and short the time spent actually thinking what an undertaking this might prove to be. Short, in fact was this pair's experience of 400 m, 10 plus pitch routes at any grade at all, much less 400 m 10 plus pitch VS 5a routes on remote Scottish granite. Was that enough to dissuade us though? Enough to cause even a momentary lull in our eagerness to slog for 2 hours down Glen Rosa to the foot of The South Ridge in the sweltering furnace of that great day( well alright it was warm ), midge plagued and thirsty as we were? Er.. no. 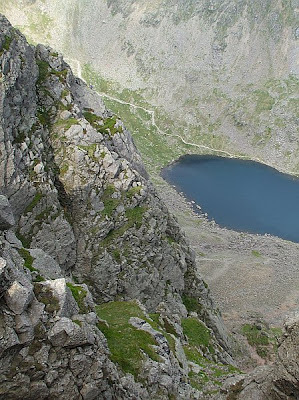 The route looked fantastic as it came into sight on the walk-in and as we geared up at the foot of the ridge, the rising wind served as a natural counterpoint to our rising excitement and anticipation ( blimey ! ). So off we set, with a single 60 metre rope, Graham leading the first pitch. This was accomplished easily enough and as the party of climbers seen earlier seemed to have gone round the corner to Sou' Wester Slabs, it seemed as though we might have the route to ourselves. This in fact proved to be the case and what a rare treat to spend a day on a climb like this with nobody else in sight. 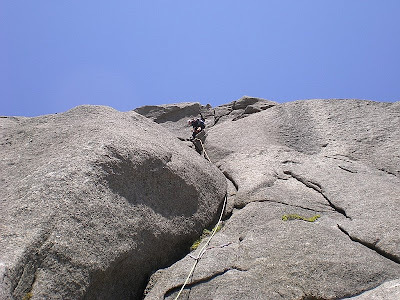 We swapped leads on the subsequent pitches, enjoying great quality climbing on pristine rock. Slab sections could be quite run out with little gear, but the beautifully clean granite gave superb friction and confidence. The route also twists and turns quite a bit too, so our long rope proved very useful. So, in fine style ( in terms of climbing rather than route finding ), we made our way to the foot of the famous "S Crack" pitch. Looking up from the belay we reckoned that it didn't actually look that bad. The crack's are quite short- about 4 metres- and don't look as exposed, overhanging or brutal as they prove to be on close acquaintance. Graham gave it a real good go, falling off a time or two before we swapped leads. As it was, Jeff only managed it by blatently pulling on a piece of in-stitu gear, in addition to shameful use of belly and knees. That's the 5a bit then. Oh but on they went these happy pilgrims, ever on and ever upward, pitch after exposed pitch, into the teeth of the rising wind, which took 20 meter loops of rope high in the air, almost pulling it from tired hands( put some gear in then Jeff ). Long, long pitches with the leader out of sight and vain shouts gone unheard in the shriek and clamour of wind and granite and sudden gusts after brief lulls close to plucking hapless frail men from their tenuous perches( this would have been about the time that Graham need a pee and you know what they say about peeing into the wind.............), until they reached the grassy terrace just below the Rosa Pinnacle with just two more pitches to the very top. So we shook hands, packed up and started the long walk down. Now if leaving out the Rosa Pinnacle seems a bit anticlimactic, it didn't feel it at the time. We knew we would be back to do Sou' Wester Slabs in a day or two and planned to do it then. 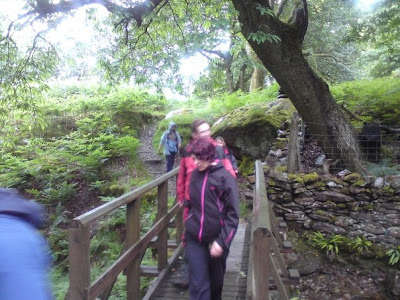 Also the lateness of the day and the tiredness of the legs and the longness of the walk back down the valley, never mind the hungryness off the belly and the eagerness to get to the pub, all made us feel like it was a great time to go. And it was. And it had been. A great great time on a great great climb. Richard and AndyG started the ball rolling with a trip to Lochranza. They took one look at the approach to the crag and decided that a tour of the distillery seemed so much more inviting. After lunch and a few samples they decided that they had better do a bit of climbing. 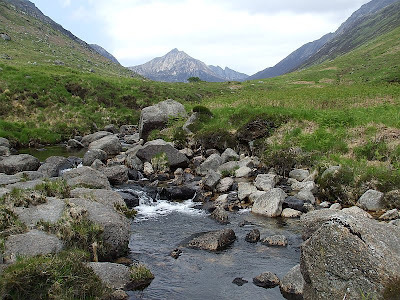 So, armed only with a copy of "Stone Country," a guide book to "Bouldering in Scotland," acquired in a sale for the truly bargainous price of only one pound, they drove down to Corrie to explore the boulders. They started on the Cat Stone which has an easy slabby side and pleasant views of the sea. The boulder has survived an attempt to blow it up and the old shot holes provide the key to starting several of the routes up the road-side of the boulder. It really is right beside the tarmac and requires care when descending from the rock, whether intentionally or unintentionally. Also, as Mike discovered, a sketchy or unconfident climbing technique can prompt passing motorists to sound their horns in warning. On the seaward side of the road, opposite the Cat Stone, is a short slabby ramp which provides an amusing "hands-free" problem. 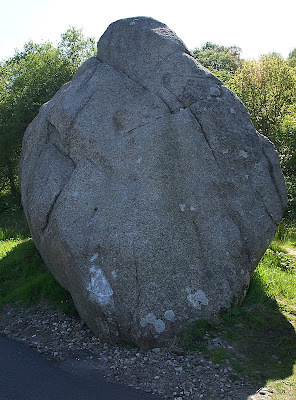 Next is Clach an Fhionn otherwise known as the Hero Stone. 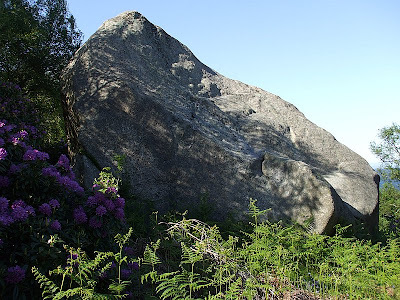 This is easily the most accessible boulder anywhere. If your driver parks straight in the layby, it's less than two big strides from the car door to touch rock. 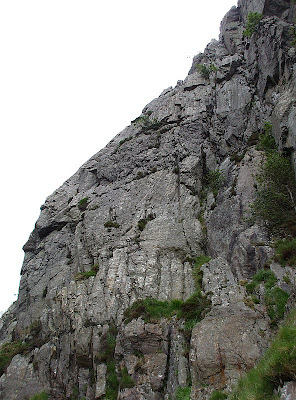 Although AndyG and Richard first climbed this using a side pull to assist standing up on a tiny little toe-hold(as demonstrated by Richard in the video below), it did eventually succumb to a direct approach. On AndyG's second visit to the boulder, Jeff got his brave head on and ascended directly up the blank looking centre of the slab. Eventually, following his example, everyone learned to trust the friction of the fine granite. The Hero Stone also provided much amusement when we attempted to climb the descent route from a sitting start in a recess in the side of the boulder. Again there is another subsidiary stone which provided us with a variety of entertaining problems. "Hands-free" traversing, one footed dynoing(i.e. hopping onto the rock) and Graham's speciality, "feet-first" climbing. He almost lost it at one point and we wondered what we were going to say to explain how Graham had managed to fall on his head when he was only at arms length above the ground to begin with. 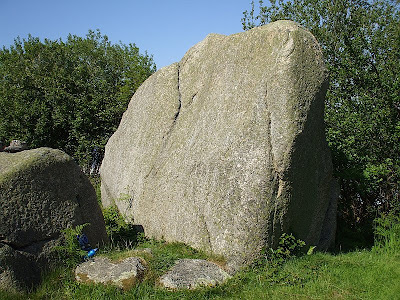 The other major boulder that Richard and AndyG visited is Clach Dhruim a'Charn. 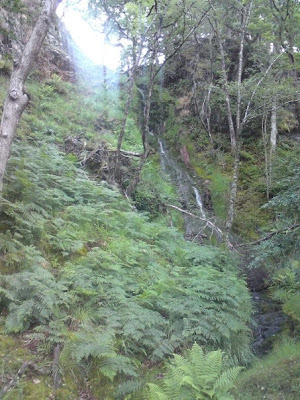 It is just visible from the road leaving the South end of Corrie where it's top can be seen poking above the trees. 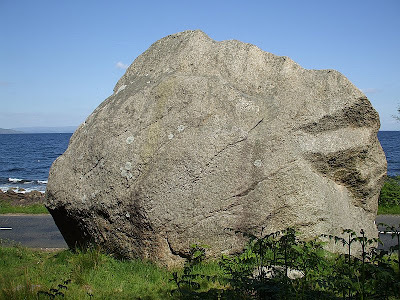 This one is a giant, it is the biggest and tallest of the boulders that we visited on Arran. It has a combination of steep or overhanging starts with slabby finishes high above the ground. Bouldering on Arran turned out to be a surprisingly intense workout and not the easy rest day that we had imagined. Also, the granite is pretty rough on your skin. And finally, remember that too much bouldering can make you look like a Smurf.